Hey little jewels! I hope you guys are great this week and counting down the days to Christmas and New Year. I am counting down the days but I do not want this month to end just yet! So many things to accomplish yet so little time. This year I am back attending JewelFest after a year on hiatus - because 2013 was a crazy year and I am so happy to be supporting not only JewelFest but also a much-celebrated Singaporean designer - Zenchi. Will talk about his show - Alice in Wonderland soon! I was really overwhelmed by everything, from the beautiful tent, all the wonderful jewelries, and the amazing people I met, there are so much to talk about. Let's cut to the chase and talk about JewelFest's highlights! This year would be the 12th run of Asia's most prestigious luxury, fine jewelry affair - Singapore JewelFest, dazzling the world with $290 million worth of jewelries. They were simply beautiful! It is also enlightening to know that more exotic countries like Australia, Brazil and Spain are participating in JewelFest this year. Every year in JewelFest, I will never fail to look out for their finest of the finest. The most iconic and most expensive jewelry for sale! I had my jaw dropped at the iconic shimmering Spirit of Ecstasy which is designed by no other than US based jeweller, Mouawad. Spirit of Ecstasy is the ornament you see in front of Rolls-Royce Motor Cars. Also known as The Flying Lady, it is draped in exquisite gown of 2,300 round brilliant-cut diamonds. Of which, it took three of its master craftsmen over 350 hours laying those 38.53 carats of diamonds in pavé (in its place). I was so impressed that this question just came out from my mouth - "Wow! Can it be attached to the car?" The answer I got from Abraham was blunt, yet funny and it was, "Yes you can, but I don't think anyone would do that. Otherwise anyone can just take it!" That made so much sense. Moving on, I also had the chance to see something that I adore, but not meant for men. It was the Grand Esmeralda Suite - also by Mouawad. You can always get it for your girlfriend or mummy. Mouawad is quite a giant in the jewelry industry in case you don't know - has designed for A-list celebrities like Angelina Jolie and Jennifer Lopez. Valued at $16 million, The Grand Esmeralda Suite is a set of necklace and earrings with an aggregate of 76.82 carats of unoiled emeralds (if it is oiled it means you have to send for maintenance to retain its gleam, here, no need to), and 188.207 carats of diamonds. Such a small piece at such price, definitely an embodiment of luxury. Probably something Lisa Vanderpump would wear! This year, I managed to catch two hot jewelry houses that I find really, really interesting. Firstly was Singaporean jewelry house - Kinchos. It is one of the newest addition in the jewelry market that was established in 2013. Having been established for a year, Basil Leong's (the designer) designs reflect the vibrant and dynamic melting pot of cultures that is the underlying fabric of Singapore. His collections are classic and elegant, with a modernised twist. 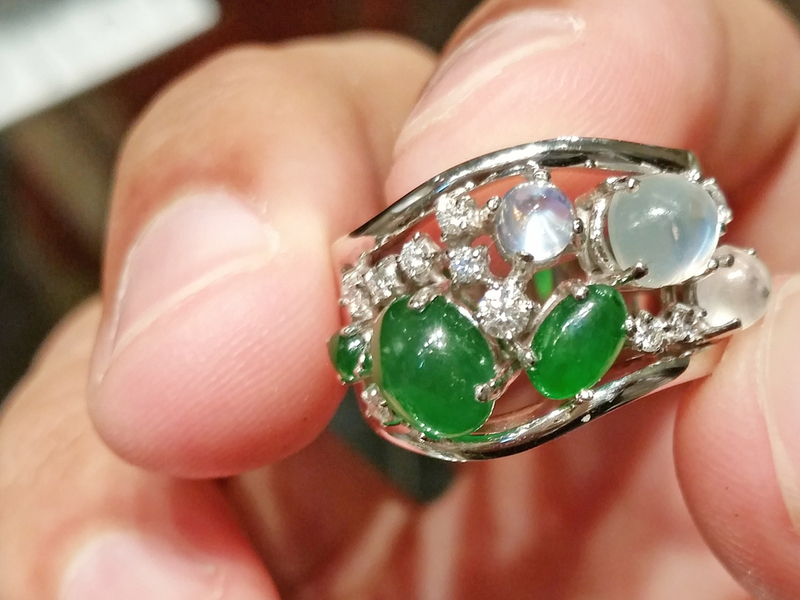 Like this beautiful ring, it is a harmonious fusion of traditional jadeite amounting to two carats, 1.58 carats of moonstones (rarity indeed) and 1.16 carats of diamonds. Having said that, Kinchos is one of the brands that I would look forward to get my dose of bling from, because the designer is a gemologist graduate! He could well be my precious stone guru! From Italy, I present you Buzzanca - the designer, Mario Muzzanca is really creative when it comes to precious metals, exotic pearls and of course, diamonds. I was really astounded by how all these raw materials been designed to be very masculine and virile. 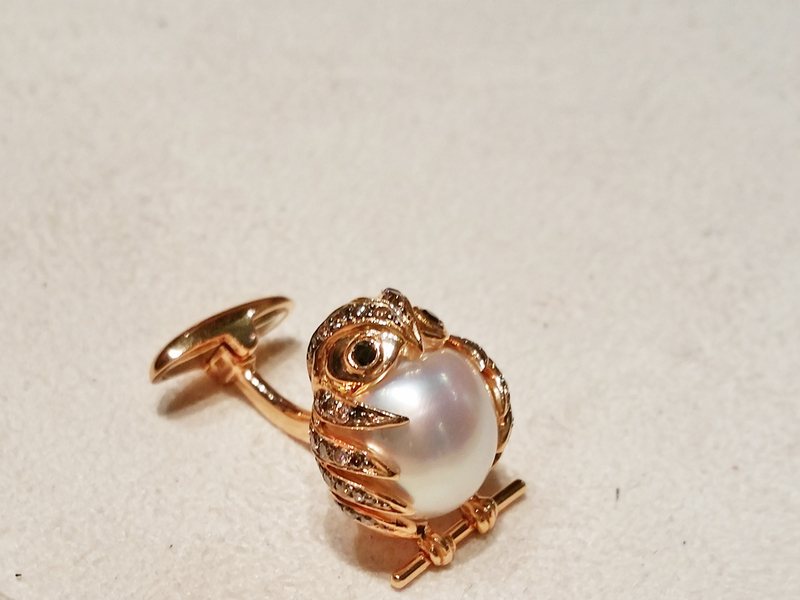 What really amaze me was the cufflinks from his owl collection - because if you guys have been following me on social media, a few months ago, an owl perched on my ledge and I find it really mystifying to have an owl on a day time sitting by my window. It was huge! So when I saw those cufflinks, it really resonates with my experience. Owls are cute anyway! Is it a sign I should get those cufflinks? Call me confused, indecisive, bias, or whatever. I hate snakes, they are my pet peeve. They are slimy, they are long, and they are dangerous. Just disgusting. I don't really mind snakes being dangerous because given the chance, I actually would love to adopt a lion, cheetah, or other huge and ferocious majestic felines. Call it double standard, but I found a not-at-all disgusting snake on one of Buzzanca's displays. I am not one who wears anything with animal or human figures - because I like it plain and timeless but this ring is simply beautiful beyond words. For those who dote on horses instead, with $70,000, you can have this ring below. How do I look? Well, I am hopeful to see more jewelries for men next year at JewelFest! It is a definitely must-go. Especially to my Indonesian friends who are reading this, you will love it because it is everything exquisite and lush you can find under one roof. Till then!